A group of seven professional Swedish women in Singapore have formed the charity organization Together for Charity. As expat wives, they realized that their life situation in affluent Singapore is extremely privileged compared to that of most people in the neighboring countries, and they want to make a difference where they can. I got a chance to talk to two of the founders of Together for Charity, Stina Hotine and Elisabeth Lewenhaupt, and they told me, with great passion and energy, how their one-year old charity organization has already made a huge impact in the lives of others. We wanted to change the lives of children who are less fortunate, by changing our own behaviors in our daily lives. We also wanted to show others how fun and easy it can be to give a little or a lot to those with less. We wanted to find simple ways to contribute and then make them a part of our and many other people’s lives. “People want to know what their donations do and how effective they are”, says Elisabeth, and shows me the printed gift card where the donor can specify what the amount they donate will achieve for the needy children. At the moment the organization concentrates their aid to two different projects. One is Deak Kum Pa Orphanage in Luang Prabang, Laos, and the other is The English School of Mui Ne in Vietnam. Deak Kum Pa Orphanage is run by the Lao government, and to a great extent managed by Australian Andrew Brown. Andrew relies on donations and makes singlehandedly sure that every penny that is directed towards the children is put to the best use. 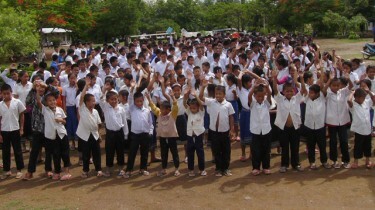 Deak Kum Pa is now home to over 500 children and this number is increasing. The orphanage also operates as a school; positioned on the edge of the town, the very basic brick and concrete dormitories and school classrooms are set in grounds reached by dirt road and a wooden bridge. With the inclusion of the very basic school services at Deak Kum Pa, these children can in some small way be considered fortunate; however the school is severely in need of additional staffing, resources and equipment. Nutrition was one of the first concerns for the orphanage, with only one meal a day with rice and soup the children had limited ability to grow and learn. Today the children enjoy meat, fruit, egg and bread on a regular basis. 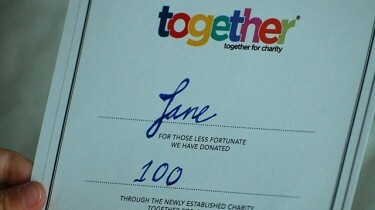 Together for charity has through its generous donors raised enough money to provide for 30 additional children to come to the orphanage during 2012. The English School of Mui Ne in Vietnam has come a step further in the development. They are inviting children among the poorest in the village to learn English in order to be able to make a living in the future in the growing tourism industry. As they expect these children to be able to support their poor families in the future, they carefully choose the neediest candidates to admit – and always just one sibling from each family. At the school, which is in addition to the regular school during the weeks, the kids are not only taught English, but also valuable lessons of friendship and sharing as well as computer skills. Many students have through their interaction over the internet discovered possibilities for themselves for the future and have dreams that they could never have imagined before. …is proud to announce that we recently have taken a big step forward in our development, as we are now able to support our students through higher education. Thanks to our generous donors and hard work from everyone involved in the organization, English School of Mui Ne now has a second location, a student home in Phan Thiet (a city next to Mui Ne Village). As the result of rigorous work and many hours of preparation, the 31 students who took their entrance examination earlier this summer all got accepted and started their semester of High School a few weeks ago. The English School of Mui Ne sends a warm THANK YOU to Together for Charity for all the books they sent! All the students are busy reading and filling up the library with new literature on varies topics. Elisabeth and Stina make sure to emphasize that Together for Charity is a lifelong project that they have taken on. They keep it very simple and personal, focusing on only two projects at the moment. They keep close contact with the two entities and target 100% of the funds they collect towards them.